Healthy gums for healthy teeth. Are your gums receding? Do they bleed when your brush your teeth? Gum disease can be a serious problem and can even lead to you losing your teeth. Gum disease and receding gums can be treated and even prevented. Gum disease is a common health problem that affects up to half of the population. It is caused by bacteria that live naturally in your mouth and collect on the teeth as plaque. These bacteria, their toxins and your immune system’s response to them result in inflammation of the gums around your teeth (gingivitis) which can progress and destroy healthy gum tissue over time eventually causing the tooth to become loose and lost. When this process damages the gum tissue which then separates from the tooth surface to form a pocket under the visible gum line, it is known as periodontitis; the root can become exposed as the bacteria migrate further under the gum. This can cause gum infections, redness, swelling, bad breath, loose teeth and finally tooth loss. It is possible when you have bleeding gums initially to prevent this disease process progressing by careful home care and regular visits to the dental hygienist who can help you to become very efficient at cleaning your teeth for your susceptibility. This can also be achieved by scaling above and below the gum line, to ensure that the normal depth of the gum crevice does not fall below normal limits of 2-4mm of pocketing in health. When active treatment is not sought the gum disease may progress further and the pocketing may increase over time causing the teeth to be very inflamed and bleeding every time you brush them. This bone around the teeth may become progressively lost as it attempts to move away from the inflamed gums thus causing bone loss and teeth loosening; and finally the teeth may be lost. It is not possible to remove the bacteria from ones’s mouth fully and some of them we need to protect us; although the gum disease process is a complex one with genetic factors as well as host factors, habits such as smoking can markedly increase your risk of not only getting gum disease should you be susceptible but also of you loosing teeth in the long term. Although, plaque containing bacteria is the main cause of gingivitis and periodontal disease (gum), how your body’s is able to respond via its immune system is also critical in how far the disease progresses and how successful we are at helping you to treat it. There is also now good evidence, especially in males, that bacteria from these pockets may circulate around the body and cause damage to the lining of blood vessels. This in turn may predispose to earlier coronary artery disease. In women, gum disease is linked to lower birth weight babies. Hygienists can physically clean all exposed root surfaces under the gum-line under local anaesthetic for your comfort. This will remove most of the toxins and allow some degree of healing. Occasionally some teeth may be beyond reasonable hope and I will advise that these are removed early to prevent further bone damage. We may also take the decision to prescribe for you two antibiotics to take on the day of treatment and for 7-14 days afterwards. These will help to keep bacterial numbers down during the healing phase. I normally recommend Amoxicillin 500mg (or Clindamycin 150mg if you are allergic) and Metronidazole 400mg 8 hourly, starting on the morning of your visit. This regimen will have certain side effects. Primarily, it may give you a tummy upset due to disrupting gut bacteria. I would recommend taking “friendly bacteria” supplements containing Lactobacillus and Acidophilus bacteria (available in most bio-yoghurts) to help avoid this. Please do not drink alcohol during your course of antibiotics, since there is a specific reaction of Metronidazole with alcohol that may make you feel ill. When plaque is successfully removed from the tooth and root surfaces, this helps to keep bone from being lost. It is even possible to promote some limited bone regeneration as a direct result of the body’s own healing process. However, in areas where there has been extensive bone loss, regeneration will be difficult to predict. Once the initial full mouth detoxification has been completed, your susceptibility to gum disease is unlikely to change, so your cleaning needs to be of a very high standard to enable control of the disease in the future. It cannot stress too strongly the importance of very regular (ideally 6-8 weekly) maintenance visits with the hygienist or with our specialist preiodontist once the initial cleaning has been completed. Multiple well-controlled studies have confirmed that the long-term success of periodontal treatment is related directly to the frequency of maintenance visits. Maintenance of hygiene visits after extensive treatment leads to relapse after a few months. The response of the tissues and the individual teeth will allow us then to make better-informed decisions regarding long-term care and maintenance. Occasionally, systemic conditions may be contributing to the problem by damping down your natural immune response to your bacteria. The most common by far is diabetes, which can run in families. I normally advise patients presenting with advanced disease to arrange an up-to-date diabetes test with your GP as soon as practicable. 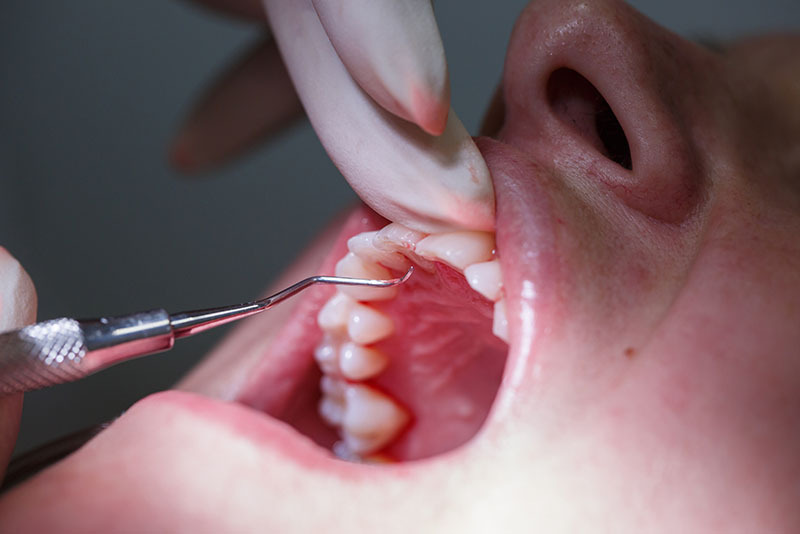 Diabetes and periodontal disease are intricately linked, with one affecting the severity of the other, so if you do have a tendency, it is best to discover it or rule it out at an early stage. Following cleaning, the gums will be somewhat sore for a day or two. The level of discomfort is usually not so great as to stop you from going on about your daily business. There will be some gum recession over the next few weeks as your inflamed tissues heal. The gums shrink back slightly from their current positions. This is not further loss of gum but merely shrinkage of inflamed tissues to healthy levels. Unfortunately, the exposure of the root and the recession of the gum is an unavoidable consequence of periodontal disease and its treatment. Teeth may become more sensitive to temperature in most cases, and although this is transient, it will tend resolve of its own accord over a few days or weeks. It may be difficult for you to clean properly for a few days if the gums are sore, but you will be provided with a chlorhexidine gluconate mouthwash (Corsodyl) which is a very effective substance at preventing new bacterial growth (however, it will not remove established plaque adherent to the teeth). Corsodyl is used commonly as a “chemical toothbrush” to control plaque levels during healing. It can be used for long periods but has the tendency to stain teeth so most patients only use it for a week or two till they are able to thoroughly clean their teeth normally. Gum disease can be successfully treated and controlled using treatment procedures mentioned above, and usually further intervention is required in areas that prove resistant to the initial treatment. This may involve simply repeating the deep cleaning procedure in selected sites. Should the patient response to gum treatment not be an optimal one, then more surgical procedures to regenerate bone and gum can be used that will be targeted at specific sites and these will be discussed with you when your initial response to the above therapy is assessed a few months after the initial treatment. There is no doubt that patients susceptible to gum disease require lifelong hygiene maintenance to ensure disease remains controlled and visits every 6-12 weeks are routine. This is a modest investment to keep teeth and bone that would otherwise be lost. Teeth lost through gum disease are very challenging to replace due to the concurrent loss of bone. Dental implant treatment in such patients is compromised by sparse availability of bone which may need to be augmented with separate procedures. Once carried out, implants and any augmented bone may also be susceptible to the equivalent of gum disease around implants. Unchecked, this can advance to peri-implantitis (the equivalent of periodontitis) and can normally only be treated only with a surgical approach. The implant may be lost if this disease is allowed to progress. It is imperative that regular hygiene maintenance and immaculate levels of oral hygiene are maintained for long term stability of results.